Proteins were first separated by electrophoresis according to charge. 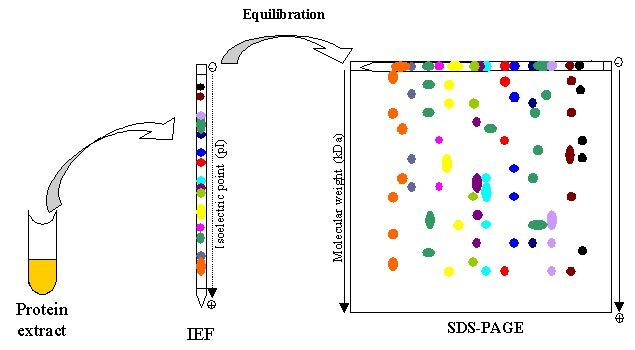 Isoelectrofocusing (IEF) was carried out with protein samples with an equivalent to an extract of 8 400 seeds, corresponding to about 150µg protein for all samples. Proteins from the various extracts were separated using gel strips forming an immobilized non-linear pH gradient from 3 to 10 (ImmobilineTM DryStrip pH 3-10 NL, 18 cm; Amersham Pharmacia Biotech). Strips were rehydrated for 14 h at 22°C with the thiourea/urea lysis buffer containing 2% (v/v) Triton X-100, 20 mM DTT and the protein extracts. IEF was performed at 22°C in the Multiphor II system (Amersham Pharmacia Biotech) for 1 h at 300 V and 7 h at 3500 V. Proteins were then separated according to size. Prior to the second dimension, the gel strips were equilibrated for 2 x 20 min in 2 x 100 ml equilibration solution containing 6 M urea, 30% (v/v) glycerol, 2.5% (w/v) SDS, 0.15 M bis-Tris, and 0.1 M HCl (Görg et al., 1987; Harder et al., 1999). DTT (50 mM) was added to the first equilibration solution, and iodoacetamide [4% (w/v)] to the second (Harder et al., 1999). Equilibrated gel strips were placed on top of vertical polyacrylamide gels [10% (v/v) acrylamide, 0.33% (w/v) piperarine diacrylamide, 0.18 M Trizma base, 0.166 M HCl, 0.07% (w/v) ammonium persulfate, 0.035% (v/v) Temed]. A denaturing solution [1% (w/v) low-melting agarose (Gibco BRL), 0.4% (w/v) SDS, 0.15 M bis-Tris, and 0.1 M HCl] was loaded on gel strips. After agarose solidification, electrophoresis was performed at 10°C in a buffer (pH 8.3) containing 25 mM Trizma base, 200 mM taurine, and 0.1% (w/v) SDS, for 1 h at 35 V and 14 h at 110 V. Ten gels (200 x 250 x 1.0 mm) were run in parallel (Isodalt system from Amersham Pharmacia Biotech). For each condition analyzed, 2D gels were made in triplicate and from two independent protein extractions.